Home Office Necessities and more! Your home office is the hub of productivity in your home. Whether you are working your 9-5 remotely or orchestrating your next big business deal, your home office should be an inspiring and stylish space. 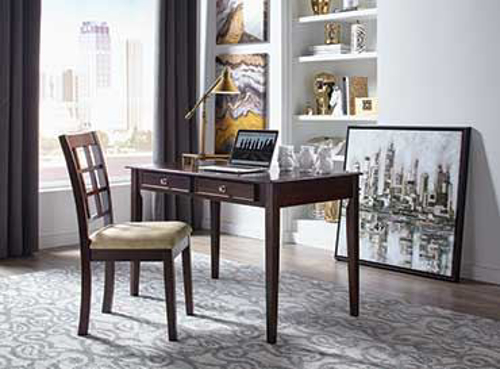 Whether you have a spacious room or a cozy nook, Badcock Home Furniture &more has all the items you need to affordably furnish your home office. Ready to spruce up your home office? Badcock offers affordable in-house financing. Browse our great selection of home office furniture and accessories or visit your local store today. Our friendly staff will try to understand your needs and help match you with the perfect home office. Plus, with our low prices, you can re-invest the money you save on furniture back into your business. Find out how our easy financing can make your home office dreams a reality! This cherry finished bookcase is constructed of Poplar solids and Birch veneers and is corner blocked with a screwed on back for added strength. With three sizes to choose from, you can find your perfect combination of storage and style. The 48"H bookcase features 3 adjustable shelves. Bookcase features heavy crown and base moldings, and a rich 6 step lacquer finish making them a beautiful addition to any room in your home. This bookcase is also available in oak. Other sizes also available. This cherry finished bookcase is constructed of Poplar solids and Birch veneers and is corner blocked with a screwed on back for added strength. With three sizes to choose from, you can find your perfect combination of storage and style. The 60"H features 4 adjustable shelves. This bookcase features heavy crown and base moldings, and a rich 6 step lacquer finish making them a beautiful addition to any room in your home. This bookcase is also available in oak. Other sizes also available. This cherry finished bookcase is constructed of Poplar solids and Birch veneers and is corner blocked with a screwed on back for added strength. With three sizes to choose from, you can find your perfect combination of storage and style. The 72"H features 5 adjustable shelves. This bookcase features heavy crown and base moldings, and a rich 6 step lacquer finish making them a beautiful addition to any room in your home. This bookcase is also available in oak. Other sizes also available. This oak finished bookcase is constructed of Poplar solids and Birch veneers and is corner blocked with a screwed on back for added strength. With three sizes to choose from, you can find your perfect combination of storage and style. This 48"H bookcase features 3 adjustable shelves. Bookcase features heavy crown and base moldings, and a rich 6 step lacquer finish making it a beautiful addition to any room in your home. This bookcase is also available in cherry. Other sizes also available. This oak finished bookcase is constructed of Poplar solids and Birch veneers and is corner blocked with a screwed on back for added strength. With three sizes to choose from, you can find your perfect combination of storage and style. The 60"H features 4 adjustable shelves. This bookcase features heavy crown and base moldings, and a rich 6 step lacquer finish making them a beautiful addition to any room in your home. This bookcase is also available in cherry. Other sizes also available. This oak finished bookcase is constructed of Poplar solids and Birch veneers and is corner blocked with a screwed on back for added strength. With three sizes to choose from, you can find your perfect combination of storage and style. The 72"H features 5 adjustable shelves. This bookcase features heavy crown and base moldings, and a rich 6 step lacquer finish making them a beautiful addition to any room in your home. This bookcase is also available in cherry. Other sizes also available. The Ashland oak bookshelf has an iron frame and 5 shelves for storing books or displaying family photos and other mementos. 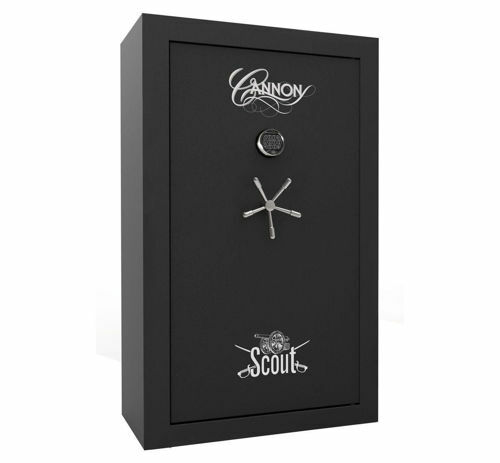 Protect treasured valuables and other important items with the Cannon Safe Scout series safe. 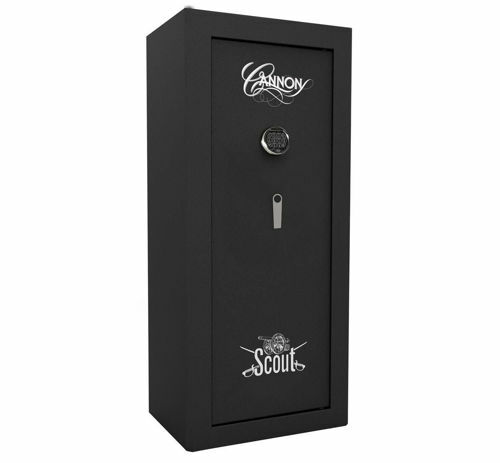 Equipped with an easy access electronic lock protected by Triple Hard Plate, four 4" locking bolts, and Trulock Internal hinges this safe protects against prying and drilling. The 45 minute fire rating and triple fin smoke seal provide extra safegaurds in event of a fire. Two shelves and door organizer kit help keep all things organized. Executive desk chair with contoured lumbar support. Perforation in the center of chair areas allows for breathability. Comfort in style with sculpted arms with pillow pads and pneumatic seat height lift with tilt tension knob. Polyurethane. Weight capacity: 250 lbs. Seat height from the floor at its lowest point is 43"H and at its highest is 46"H.
Bigman desk chair true comfort in biscuit brown polyurethane, layered body pillows with extra gathered center zones, sculpted arm rest and pneumatic seat height adjustment. Weight capacity: 250 lbs. Big and tall executive chair with Smart Layers Technology by Serta with 5 layers of comfort foam on individual ComfortCoils™. Harmony coffee polyurethane, contoured Lumbar zone and Ergo Touch height adjustment. Weight capacity: 400 lbs. Smart layers big and tall executive chair with air premium big and tall air chair, smart layers technology by Serta with 5 layers of comfort foam on individual ComfortCoils™. Harmony coffee polyurethane, contoured Lumbar zone, Ergo Touch height adjustment. Weight capacity: 400 lbs. Manager’s desk chair upholstered in Puresoft polyurethane with padded cushions that offer added comfort and pneumatic height adjustment. Weight capacity: 250 lbs, seat height at lowest point from floor is 34.5" H, and at its highest point is 38"H.
Merlot study desk. Other pieces sold separately. 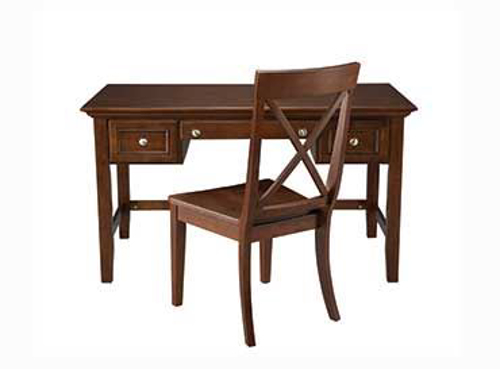 This merlot desk and hutch make the perfect place for your child to finish their homework before bedtime. Other pieces sold separately. 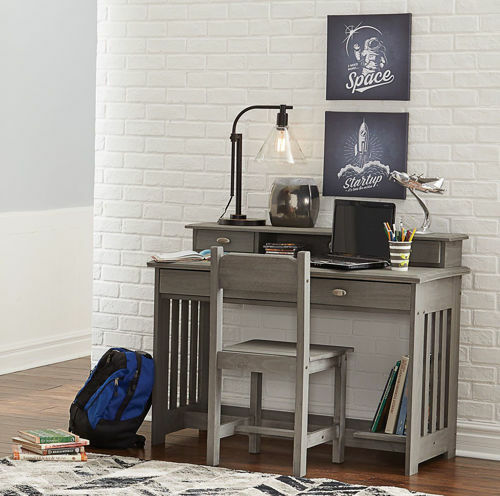 Whether used for drawing, surfing the web or doing homework, this desk is sure to be in your child’s life as they grow and thrive. Finished in a sleek charcoal grey it won’t be going out of style any time soon and is sure to fit any existing décor. The hutch has ample storage, this piece is an absolute necessity for a very busy kid. Check out the rest of the Greyson Collection and infuse its universal appeal into your child’s bedroom today. This geometric bookcase has a weathered grey finish with 10 shelves for lot's of display or storage abilities. Enjoy this five shelf bookcase in any room of your home. The shelf features five wooden shelves and a rustic finish. This library bookshelf features solid wood construction, a burl finish and black metal inserts on the doors. Storage trunk with safety hinge. Decorative raised hand painted cream colored seashells adorn the front and sides. This 9 cube bookcase features simple lines and tons of storage and workspace. The mocha finish and maple solids and veneer construction add style and stability to this all-in-one solution for storage in your work-from-home needs. This file cabinet features simple lines and tons of storage and workspace. The mocha finish and maple solids and veneer construction add style and stability to this all-in-one solution to your work-from-home needs. Cabinet features one drawer and shelf.